Upper respiratory tract infections (URTI) are highly incident infectious diseases, which affect adults 2-5 times per year. These infections include common cold, sore throat, sinusitis, laryngitis and otitis media and may involve several regions of the upper respiratory tract simultaneously. URTI comprises seasonal infections, many prevailing during winter season. Several factors may predispose an individual to acquire these diseases, including his immune state, exposure to pollution or smoking and asthma[3,4]. Although some studies have confirmed the impact of allergy on rhinosinusitis resulting from a higher number of receptors for rhinovirus on allergic patients, the role of allergy as a predisposing factor for URTI is controversial. Furthermore, gastroesophageal reflux disease (GERD) may also induce respiratory symptoms (eg. chronic cough), resulting from bronchoconstriction through vagal reflex or by aspiration. Even though GERD can lead to misdiagnosis, it is also considered as a predisposing factor for URTI triggered by chemical injury. Although it is relatively difficult to establish a differential diagnosis in pharyngitis, the Centor criteria are highly recognized and commonly used during patient observation. These criteria consider the signs and symptoms most commonly involved in pharyngitis, which can be summarised by: presence of pharyngeal exudates, anterior cervical adenopathy, fever and the absence of cough. Consequently, in the presence of at least three of these features, it is possible to predict that the infection is probably of bacterial origin. Rhinosinusitis can be classified as acute sinusitis, when the duration of the symptoms is less than one month; subacute, when the symptoms persist for twelve weeks, and chronic when exceeding twelve weeks. Sinusitis may also be classified as recurrent when the individual presents four or more episodes per year. Antibiotic treatment instituted in these URTI is essentially empirical since the microbiological diagnosis is rarely made, due to the time limitations, difficulty in obtaining clinical samples (sinusitis) and costs of rapid tests (e.g. rapid antigen detection test for group A streptococcus)[8,9]. Taking into account that URTI are frequently caused by respiratory viruses, antibiotic therapy proves to be unnecessary in most of the cases. Nevertheless, antimicrobials are used mainly to prevent potential complications that may arise from non-antibiotic indication. In Portugal, primary care prescription focuses mainly on beta-lactamic antibiotics, especially the association amoxicillin/clavulanic acid. Antibacterial therapy may be beneficial to avoid the development of suppurative complications such as tonsillitis, sinusitis, otitis media and cellulite, however delayed antibiotic therapy can be similarly effective in preventing complications when compared to immediate and empirical prescription[6,11,12]. Furthermore, antimicrobials are indicated in certain circumstances, such as patients who have complications (e.g. pneumonia and mastoiditis), who have a higher risk of developing complications (e.g. renal impairment) and elderly over 65 with cough and presenting two or more Centor criteria, or elderly over 80 with diabetes mellitus, hospital admission in the preceding year, history of heart failure, or under oral glucocorticoid treatment. 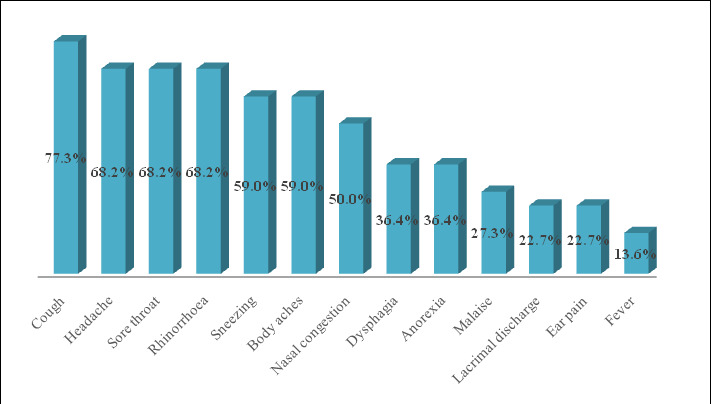 This study has focused on pharyngitis and sinusitis because these are the leading causes of acute morbidity in adults in primary care and, the majority of cases for which antimicrobials are prescribed. Also, URTI are differently expressed in children due to their susceptibility to bacterial otitis media, associated with Eustachian tube dysfunction and immaturity of the immune system[2-4]. This study was implemented through a cross-sectional study (observational non-analytical) that included a survey with clinical observation of the patients. Data gathered by both means allowed empirical classification of the infection aetiology and the need for antibiotic prescription. Data collection was undertaken between November and December of 2014. The target population included patients aged 18 or older, which represent 79.76% of the total resident population in Portugal. Paediatric patients were excluded due to specific clinical and treatment issues. Considering that recruitment was pursued in community pharmacies with a minimum capitation of 3500 inhabitants, the study population considered was 2792 inhabitants. Estimation of sample size was calculated considering a population of 2792 inhabitants, a prevalence of the phenomena (p) to be 2.36%, a confidence interval (CI) of 95% and a beta error (d) of 3%. Thus, it was estimated that it would be necessary to recruit a sample (m) of 95 patients. To define the prevalence value (p), it was considered that the prevalence of patients presenting URTI is 15.7%; from which 22% (ranging from 11 to 33%) seek health care, resulting in a prescription rate of antibiotic therapy of 68.2%. • Individuals aged ≤ 18 years. Data collection was performed during a face-to-face interview following a questionnaire specifically designed for this purpose (appendix 1). This interview included a clinical observation of the patient performed in a private consultation area. This tool comprised three sections: I) sociodemographic characterization, II) characterization of the patient’s present condition (self-reported signs and symptoms) and medical history, and III) clinical observation of signs (observed by the pharmacist). Section II of the questionnaire was developed following the Code of Good Pharmaceutical Practice, and included information about the symptoms, duration thereof, presence of relevant comorbidities and/or prescription of other medicines that could affect disease progression or therapeutic selection. Patient observation included the measurement of body temperature, observation of the pharynx and tonsils, palpation of the neck (detection of cervical adenopathy), palpation of the maxillary and frontal sinuses (pain evaluation) and the visualization of some signs such as rhinorrhoea and sneezing, as suggested by Centor criteria. Both questionnaire and patient observation enabled a complete information collection and were used in the establishment of the probable aetiology of infection and consequent need for antibiotic treatment. For quality assurance purposes, the principal investigator was submitted to a preliminary training period, which consisted on the clinical observation of a group of volunteer students, with and without symptoms of URTI, under the supervision of two experienced clinical pharmacists. Based on diagnostic and treatment guidelines, a scale was developed to empirically classify the aetiology of infections (Table 1) and the need for antibiotic therapy (Table 2)[11,13,20]. A weighting scale was defined according to the severity of signs and symptoms. This study complied with the established ethical and legal requirements, including collection of patient informed consents and the authorisation of the technical directors of the community pharmacies where the study was implemented. Patients’ were anonymised and the identity of the pharmacies involved was preserved. Data were analyzed using the Statistical Package for Social Sciences software (SPSS), version 20, including descriptive univariate analysis of the categorical (absolute and relative frequencies) and scalar variables [(dispersion measures (range and standard deviation) and measures of central tendency (mean and median)]. Bivariate analysis was conducted using non-parametric tests (simple chi-square test and Fisher’s exact test), considering a 95% confidence interval. The sample included 22 patients, implying that only 23.16% of the intended samples were recruited (95 patients). These were recruited in two different locations, 6 patients (27.3%) in Almada, Lisbon Metropolitan Area, and the remaining 16 (72.7%) in Elvas, Alentejo. Socio demographic characterization of the sample Most recruited patients were female, with a mean and median age corresponding to 38 years (σ = 16.92) and 35, respectively, ranging from 19 to 78 years. Nearly half the sample had higher education (45.5%), although educational level in Elvas was lower. On average, patients presented six symptoms ranging from two to eleven, as described in (Figure 1). During clinical observation, only one patient presented with fever (4.5%). The sign more often present was erythema of the pharynx (n=9; 40.9%). Pharyngeal exudates was present in 9.1% of cases (n = 2). Only one patient (4.5%) revealed pain or tenderness in maxillary and frontal sinuses. Palpation of the neck resulted in the identification of 5 patients presenting anterior adenopathy (22.7%) (n = 5) and one presenting posterior adenopathy (4.5%). The remaining observations revealed: rhinorrhoea in 7 patients (31.8%), sneezing in 2 (9.1%) and one patient had signs of ocular pathology (4.5%). On the other hand, history of allergy and GERD were described in 7 (31.8%) and 2 (9.1%) patients, respectively. The most often prescribed antibiotic was the macrolide, clarithromycin (n = 8; 36.4%) (Figure 2). emsp; Using the developed classification for aetiology of URTI (table 1) six patients (27.2%) were considered to present an infection with questionable aetiology (rating between 4 and 5), and only one patient (4.5%) was considered to have a possible bacterial infection. The remaining sample (68.2%, n = 15) had an empirical classification lower or equal to 3 points, which suggests the aetiology of the infection was probably viral. The prescribing pattern of antibiotics focused on amoxicillin/clavulanic acid, clarithromycin and benzylpenicillin (Table 3). Applying the second classification system, developed (table 2) for evaluating the need for antibiotic therapy, we found four patients to have a questionable result (18.2%), with classifications between 4 and 5, and only three patients (13.6%) evidenced the need for antibiotic treatment, presenting a rating above 6. Therefore, the remaining fifteen patients (68.2%) had ratings below 3, suggesting antibiotics were not required in these cases. 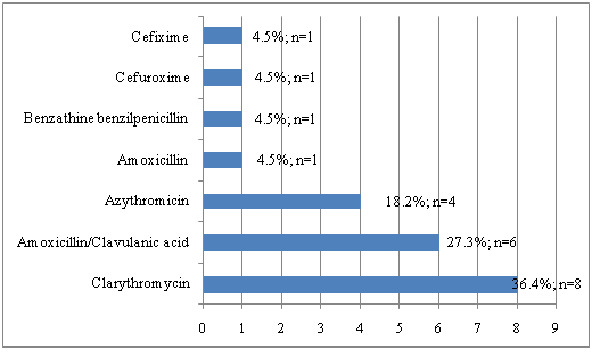 Antibiotics prescribed for patients with probable need for antimicrobials were amoxicillin/clavulanic acid and clarithromycin (Table 4). Using the empirical classification of the aetiology of infection and considering risk factors (such as age over 65), we assumed to be possible to ascertain the need for antibiotic therapy. Results suggest that most patients had viral infections and only one evidenced signs of bacterial infection. As expected, this study demonstrated a generalised overuse of antimicrobials, evidenced by the finding that only 13.6% of patients had a rating supporting antibiotic treatment. Some studies suggest that this over prescription may be a result of patients’ expectations about treatment, pressuring physicians to institute the treatment patients believe to be more effective for URTI. This suggests that is it important for healthcare professionals to explain patients that URTI are self-limiting infections and the overuse of antibiotics increases the emergence of resistances. Clarithromycin and azithromycin (both belonging to macrolide class) were prescribed in over half of the patients. However, according to the “Infectious Diseases Society of America” (IDSA) guidelines, this class of antimicrobials is considered second-line therapy in bacterial pharyngitis (except in penicillin-allergic patients). Therefore, the treatment with macrolides in rhinosinusitis must be discouraged due to the higher resistance rates of Streptococcus Pneumoniae. In addition, although benzylpenicillin is considered first-line therapy in bacterial pharyngitis, it was only prescribed to one patient, who presented an infection classified to be of doubtful aetiology. On the other hand, amoxicillin/clavulanic acid, which is considered first-line treatment in rhinosinusitis, was often prescribed in this study. Previous studies have found that in Portugal the prescription pattern for antibiotics in respiratory infections focuses on the beta-lactamics/penicillins class, especially the combination of amoxicillin/clavulanic acid and cephalosporins, followed by macrolides[10,16]. Our findings support this predominance in one of the regions studied–Elvas. In Almada, most patients were prescribed a macrolide, followed by beta-lactamics. Cough was a prevailing symptom described by patients, which may indicate that these infections were not restricted to the upper respiratory tract, also affecting the lower tract. However, taking into account the high prevalence of smoking habits in this sample and considering tobacco to be the leading cause of chronic cough, this symptom can result from lifestyle related factors. Furthermore, the presence of smoking habits is a predisposing factor for URTI, so these patients are more susceptible to acquire these illnesses. It is noteworthy that the prevalence of smoking in the sample was more than twice higher (45.5%) than the prevalence of smoking habits in Portugal (20.8%). Despite the absence of allergic and GERD patients in our sample, the relationship between these conditions and URTI has been noticed by other authors[4-5]. However, an information bias must be considered because there could have been a misinterpretation or misunderstanding regarding the questions made during the interview. Also, most of the patients were from Elvas, Alentejo, where there is an overall lower educational level which can justify the lack of awareness about the history of allergy and GERD. This study revealed some limitations, including the limited sample size, in comparison with the estimated 95 patients, which invalidate the extrapolation of results. This may be explained by the fact that when the study began, URTI were not at the peak season. Additionally, many people presenting a prescription were not the sick patient, precluding their recruitment. It may be assumed that the patients able to acquire their own medication had the less severe clinical situations, hence the high prevalence of probable viral infections aetiology. The exclusion of patients without antimicrobial prescription prevented to estimate the need for antibiotic therapy in patients who resort to the pharmacy when respiratory symptoms appear. Nonetheless, this was considered to be the best methodological option, since the presence of the principal investigator could have influenced the standard pharmaceutical intervention. The limited study period and human resources also contributed to the limited sample size. It is also appropriate to reflect on the difference of the sample size between the two locations, which can be explained by several reasons. First, the greater availability to participate in the study in Elvas; equally important was the fact that the recruitment time was different in the two locations: in Elvas, it was primarily held during shift schedules (at night and weekend). Third, it should be noted that, according to data from the General Health Directorate, the ambulatory antibiotic consumption is higher in Elvas than in other regional areas, so it can be expected an easier recruitment at this location. Finally, the study began in Almada, when URTI were not yet in seasonal peak. Consequently, due to the asymmetric sample size in these places, the comparative analysis of the data was limited, and any characterization of the sample recruited in Almada can also be compromised. However, this study was based on developing clinical competencies of a pharmacy student and as such, had to be feasible and compatible with classes, explaining the methodological option taken. The methodology used to classify the aetiology of infections and assess the need and appropriateness of the therapy is questionable for various reasons. For example, the presence of fever may have been underestimated because many patients were under antipyretic medication effect. It should also be borne in mind that the questionnaire did not include information concerning beta-lactamic antibiotic allergy, so it is not possible to establish if some of the prevailing prescription of macrolides is due to the presence of allergic patients. The scale was tested but not validated, which means that the sensitivity and specificity are unknown. Nonetheless, these scales are pioneers, developed through international guidelines, so it would be an asset to validate them on a representative sample, in the future. Despite having received a differentiated training the principal investigator was, at the time, a practicing pharmacist and his experience in observation was certainly lower than of a doctor and consequently some ratings may be subject to error or discussion. Nonetheless, we believe it was a valuable experience for the student to develop his clinical competencies further, and also for the pharmacy to have the opportunity to provide patients with an advanced service, currently not offered in most pharmacies (a complete clinical evaluation including observation when presenting minor symptoms). This pitfall of the system is not restricted to pharmacies but generalised in primary care, where doctors for many reasons do not have the opportunity to conduct a thorough and complete evaluation of the signs and symptoms, as mentioned by some patients during this study. Despite the aforementioned limitations, this study focuses on a relevant topic, introducing an innovative approach to pharmaceutical interventions, and presents results consistent with previous studies, highlighting the overuse of antimicrobials, particularly in sore throat. This suggests that the campaigns developed to promote the rational use of antibiotics, although important, are insufficient to change behaviours and could benefit from pharmacists’ intervention, a professional privileged by its trained skills and unique position in the healthcare system. These interventions could be fostered by studies like this. Antibiotic treatment prescribed in most clinical situations was probably unnecessary, since the analysed URTI did not suggest a bacterial aetiology. Clarithromycin and amoxicillin/clavulanic acid revealed a high indication. Hence, it is essential to adopt corrective measures in primary care to promote the rational use of antimicrobials, in order to fight the emergence of resistance and further decrease treatment costs. 1. Bucks, R.S., Gidron, Y., Harris, P., et al. Selective effects of upper respiratory tract infection on cognition, mood and emotion processing: a prospective study. (2008) Brain behav immun 22(3): 399-407. 2. Bentivegna, D., Salvago, P., Agrifoglio, M., et al. The linkage between upper respiratory tract infection and otitis media: evidence of the ‘united airways concept’. (2012) Acta Medica Mediterranea 28: 287-290. 3. Martines, F., Bentivegna, D., Maira, E., et al. Risk factors for otitis media with effusion: case-control study in Sicilian schoolchildren. (2011) Int J Pediatr Otorhinolaryngol 75(6): 754-759. 5. Molyneux, I.D., Morice, A.H. Airway reflux, cough and respiratory disease. (2011) Therapeutic Advances in Chronic Disease 2(4): 237-248. 6. Butler, C., Rollnick, S., Pill, R., et al. Understanding the culture of prescribing: qualitative study of general practitioners’ and patients' perceptions of antibiotics for sore throats. (1998) BMJ 317 (7159): 637-642. 7. Braunwald, E. Harrison. Medicina Interna. 15ª ed. Rio de Janeiro: McGraw Hill (2002). 8. Wong, D., Blumberg, D.A, Lowe, L.G. Guidelines for the use of antibiotics in acute upper respiratory tract infections. (2006) Am Fam Physician 74(6): 956-966. 9. Littie, P., Hoobs, R., Moore, M. Clinical score and rapid antigen detection test to guide antibiotic use for sore throats: randomized controlled trial of PRISM (primary care streptococcal management). 2013 BMJ 347: f5806. 10. Caldeira, L., Aguiar, P., Remísio, É., et al. Prescrição de antibióticos para infecções do tracto respiratório em Portugal continental. (2004) Rev Port Clin Geral 20: 417-448. 11. File, T.M., Hadley, J.A. Rational Use of Antibiotics to Treat Respiratory Tract Infections. (2002) Am J Manag Care 8(8): 713-723. 12. 12. Hong, J.S., Philbrick, J.T., Schorling, J.B. Treatment of Upper Respiratory Infections : Do patients really want antibiotics? (1999) Am J Med 107(5): 511-515. 13. Tan, T., Little, P., Stokes, T. Antibiotic prescribing for self limiting respiratory tract infections in primary care : summary of NICE guidance. (2008) BMJ 337: a437. 14. PORDATA Base de Dados Portugal Contemporâneo. População residente: total e por grupo etário – Portugal. (2014). 15. Ministério da Saúde. Portaria 352/2012, de 30 de Outubro.(2012). 16. Mateus, A. Infecções respiratórias superiores: conhecimentos sobre a doença, auto-cuidados e recurso aos serviços de saúde. (2003) Rev Port Clin Geral 19(5): 415-426. 17. Monteiro, A., Castanheira, A., Castro, M., et al. Perfil de prescrição antibiótica no tratamento das Infecções das Vias Aéreas Superiores. (2011) Rev Port Clin Geral 27(6). 18. Ordem dos Farmacêuticos. Boas Práticas Farmacêuticas para a farmácia comunitária (BPF). (2009). 19. Jones, R.M., Rospond, R.M. Patient Assessment in Pharmacy Practice. (2003) Lippincott Williams & Wilkins. 20. Shulman, T., Bisno, A., Clegg, H., et al. Clinical practice guideline for the diagnosis and management of group A streptococcal pharyngitis: 2012 Update by the Infectious Diseases Society of America. (2012) Clin Infect Dis. 55(10): e86-102. 21. Chow, A., Benninger, M.S., Brook, I., et al. IDSA clinical practice guideline for acute bacterial rhinosinusitis in children and adults. (2012) Clin Infect Dis 54(8): 72-112. 22. Gonzales, R., Barrett, P.H., Steiner, J.F. The Relation between Purulent Manifestations and Antibiotic Treatment of Upper Respiratory Tract infections. (1999) J Gen Intern Med 14(3): 151-156. 23. Plano Nacional de Saúde 2012-2016. Perfil de Saúde em Portugal. 24. Direção-Geral da Saúde (DGS). Portugal - Control of Infection and Antimicrobial Resistance in numbers. Ministério da Saúde. (2013).